byname of Giovanni Antonio Canal Italian topographical painter whose masterful expression of atmosphere in his detailed views (vedute) of Venice (see ) and London and English country homes influenced succeeding generations of landscape artists. Canaletto was born into a noble family whose coat of arms he occasionally used as a signature. How he came to be known as Canaletto is uncertain, however; perhaps the name was first used to distinguish him from his father, Bernardo Canal, a theatrical scene painter in whose studio Canaletto assisted. 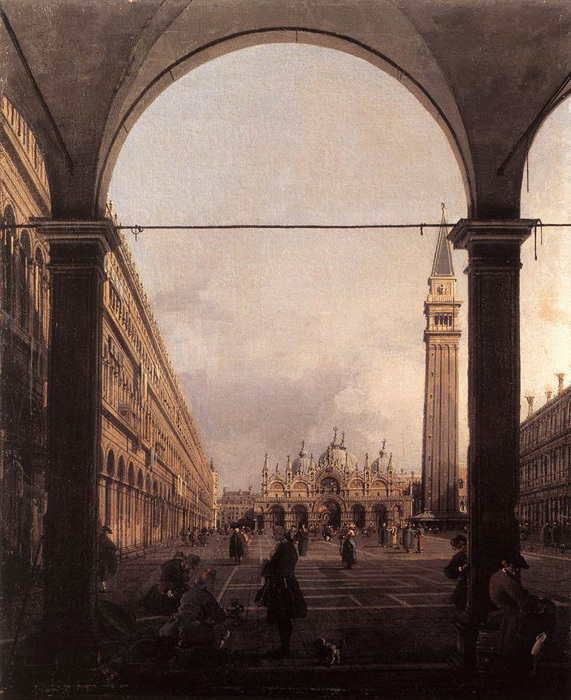 Canaletto is recorded as working with his father and brother in Venice from 1716 to 1719 and in Rome in 1719–20, painting scenes for Alessandro Scarlatti operas. It was in Rome that Canaletto left theatrical painting for the topographical career that was to bring him international fame so quickly, although a close connection to his theatrical work remained in his choice of subject matter, his use of line and wash drawings, and his theatrical perspective. When he returned to Venice, he began his contact with the foreign patrons who would continue as his chief support throughout his career. Four large paintings were completed for the Prince of Liechtenstein, in or before 1723, and in 1725–26 he finished a series of pictures for Stefano Conti, a merchant from Lucca. Dated memorandums accompanying the Conti pictures suggest how busy and yet how exacting the artist was at this time. Canaletto indicates that delays in the delivery of the pictures had been due to the pressure of other commissions and his own insistence on obtaining reliable pigments and on working from nature. In his pictures of the late 1720s, such as “The Stonemason's Yard,” he combined a freedom and subtlety of manner that he was rarely to achieve again with an unrivaled imaginative and dramatic interpretation of Venetian architecture. His understanding of sunlight and shadow, cloud effects, and the play of light on buildings support the contention in his memorandums that he was working out-of-doors, which was a most unusual procedure for painters of that time. 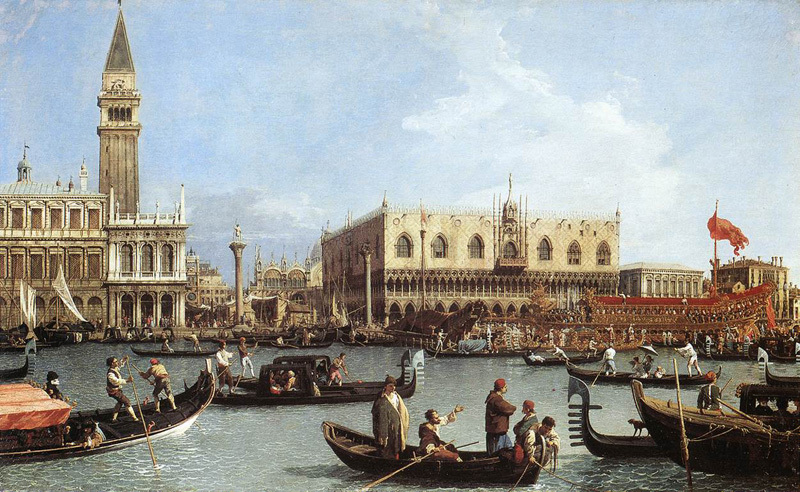 Throughout the 1730s Canaletto was deeply absorbed in meeting foreign demands for souvenir views of Venice. Such was the pressure upon him that he ultimately was forced to work largely from drawings and even from other artists' engravings, rather than from nature. He also developed the use of the camera ottica, a device by which a lens threw onto a ground-glass screen the image of a view, which could be used as a basis for a drawing or painting. Finally, he developed a mechanical technique, in which ruler and compasses played a part, and architecture and figures were put into the picture according to a dexterous and effective formula. Such a vast number of views of Venice were produced during his lifetime that it is often thought that Canaletto was head of a large studio, but there is no evidence of this. 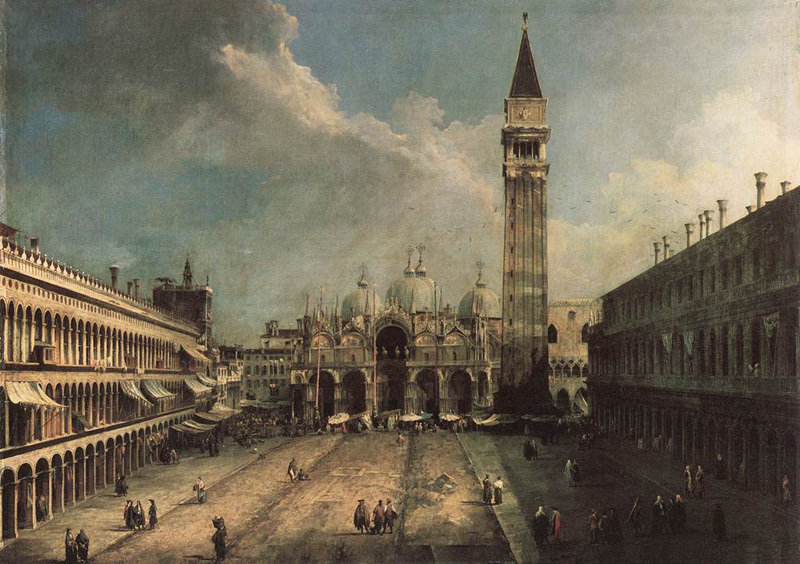 Canaletto had no serious rivals. The painter Luca Carlevaris, who may have been his initial inspiration in choosing to produce topographical pictures for a largely foreign audience, had been driven from the field; Bernardo Bellotto, Canaletto's nephew, was not yet a mature painter; and Michele Marieschi was a follower rather than a competitor. 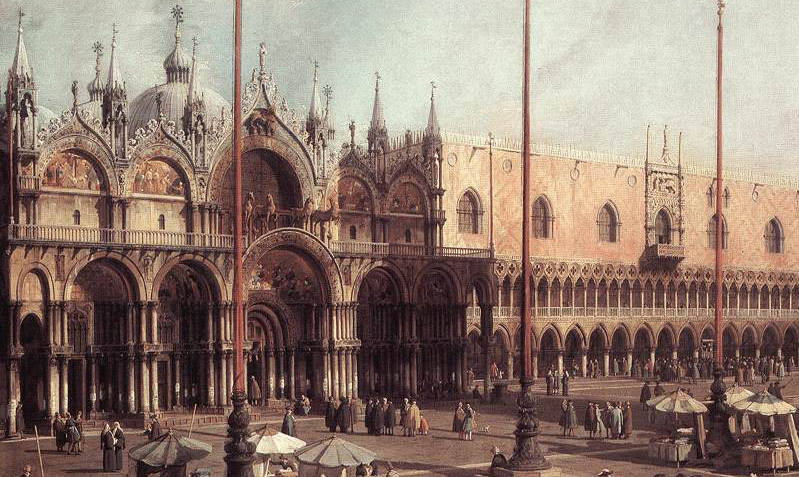 Because of this lack of rivals, Canaletto became increasingly difficult to deal with. Owen Mac Swinney, an English operatic figure and patron of Canaletto, wrote as early as 1727. The fellow is whimsical and varys his prices, every day:and he that has a mind to have any of his work, must not seem to be too fond of it, for he'l be ye worse treated for it, both in the price and the painting too. The outbreak of the War of the Austrian Succession in 1740, which cut down sharply the number of visitors to Venice, seriously affected Canaletto's commissions. At this point, an early acquaintance, Joseph Smith—publisher, merchant, and later British consul in Venice—stepped into the breach. As standardized views of Venice dropped from demand, Smith seems to have encouraged Canaletto to expand his range of subjects to include Roman monuments and the areaof Padua and the Brenta River. Pictures composed of more or less recognizable elements rearranged (capriccio ) and pictures composed of almost completely imaginary architectural and scenic elements (veduta ideata) now began to play an increasingly important part in Canaletto's work. In 1741–44 Canaletto also made a series of 30 etchings, exceptionally skillful and sensitive, showing a command of perspective and luminosity. 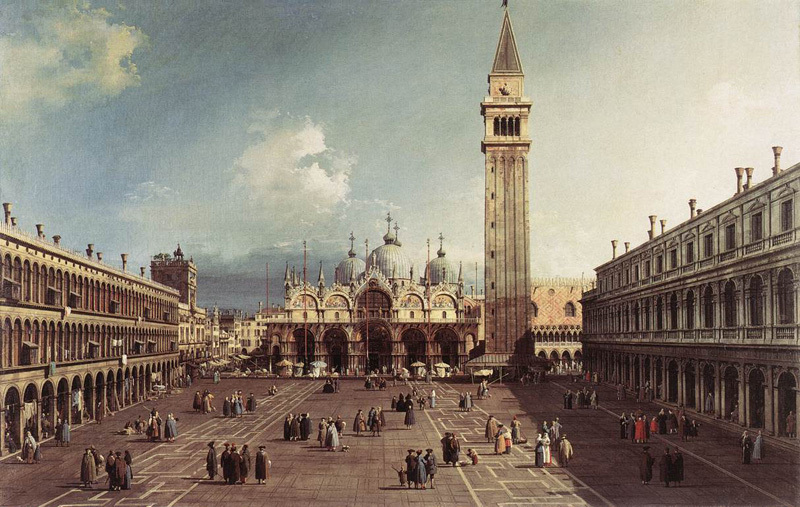 Canaletto's international reputation served him well as the tourists became more scarce. In 1746 he went to England, where he was welcomed, and remained until 1755, despite an invitation to Dresden from the elector of Saxony. He worked mainly in London, on English views. It is notable, when considering the works executed during this period, that Canaletto—an artist 50 years of age who had evolved various conventions based on Venetian experience—was dealing with an entirely different set of atmospheric conditions and different subject matter. Occasionally, by putting English material into a Venetian framework, he achieved a masterpiece, but for the most part he fell below his own standards, and his work was lifeless and mechanical. On his return to Venice, however, his reputation had not diminished; and at last he received official recognition—election to the Venetian Academy in 1763 and, in the same year, appointment as prior of the Collegio dei Pittori. 1727-28: oil on canvas; 50x82 cm; National Gallery, Washington, D.C..
Giovanni Antonio Canal, (1697-1768), known as Canaletto, painted this work for the merchant and collector Joseph Smith in 1727 to 1728. along with five similar paintings. This view shows the facades of St Mark and the Doge's Palace, the loggia of Sansovino with the soaring bell tower on the right, and St Mark's column, just visible in the background, not far from the water's edge. Much of the government of Venice was located in this area, while the fiscal and economic headquarters were located in the Rialto district. The figures in the paved square can be grouped into social classes by the clothes they wear. The entire square was traditionally the preserve of the aristocracy, to the exclusion of ordinary citizens. 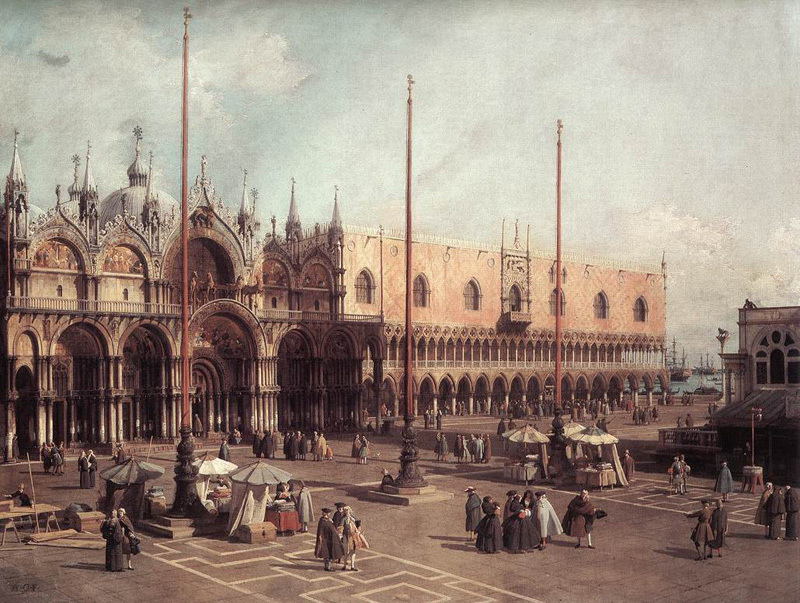 Canaletto based his townscapes on a scrupulous adherence to the rules of perspective. Before painting in colour, he undertook a geometric construction of the scene, with a detailed perspective grid. In this case, the construction of the perspective is known technically as "accidental", with the two vanishing points situated outside the picture on the horizon line, to restrain the foreshortening and tapering effect so that the buildings were given due importance and value. The artist also used a camera obscura to help with the accuracy of his composition. Standing on a rostrum under an awning near one of the porticos is a figure preaching to a small crowd. His clothes suggest that he is a monk or friar, possibly a Dominican. The Doge's Palace also housed many government offices which would have been visited by Venetians as well as visitors from the mainland. In St Mark's port the gondolas thread their way between the larger vessels. The townscape is affected by the pattern of the buildings that rise to varying heights from the flat land. It is also governed by a closely observed and insistent rhythm: that oft flagpoles, the colonnade, and the gallery, with their arches, groups of columns, and the pinnacles of the buildings. The parading crowd brings the townscape to life. In the main square and in the upper parts of the buildings, the composition is more expansive, in the lower sections, more crowded. 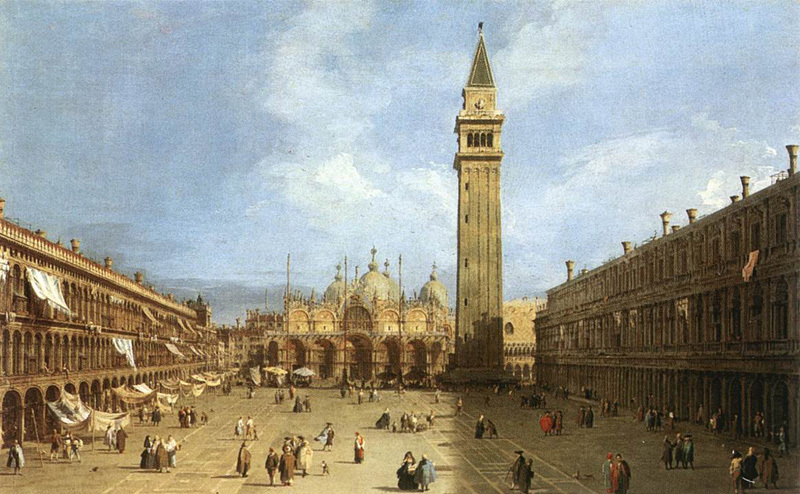 Canaletto coolly analyzes and describes daily life in the famous square. In front of the basilica there are three booths with goods on display and in trunks, shaded by large umbrellas and awnings. Dotted across the square are magistrates in wigs and low robes aristocrats in all their finely, and members of the bourgeoisie, swathed in dominoes and capes, as required by the laws of Venice. A merchant is dismantling his stall its covers lying on the ground revealing the trestle table. Canaletto's minute attention to detail and his keen observation of everyday life in his native city echoes the Dutch genre painters, whose paintings of daily life are unrivalled in their detail. The late afternoon light falls on the rose facade of the palace, the gold of the mosaics, and the ornamental details of the basilica. In juxtaposition with these tones are the contrasting shades of cerulean blue and turquoise of the sky. The shadow cast by the bell tower contributes to the distribution of the chiaroscuro; shadows are never black, but interpreted in different shades of brown and always subtly tinged with red. He saw it once more, that landing-place that takes the breath away, that amazing group of incredible structures the Republic set up to meet the awe-struck eye of the approaching seafarer: the airy splendour of the palace and the Bridge of Sighs, the columns with a lion and saint on the shore, the glory of the projecting flank of the fairy temple, the vista of gateway and clock. No other city in the world has been so extravagantly praised as Venice. In 1495 the French ambassador Philippe de Commines praised it as being "the most joyously radiant city" he had ever seen. He mentioned white marble facades, apartments with gilt antechambers and sumptuously ornate fireplaces. When Napoleon conquered Venice in 1797, he thought St Mark's was "the best drawing-room in Europe and only Heaven is worthy of serving as its ceiling". Johann Wolfgang von Goethe, who stayed in the island-dotted lagoon in September 1786 while on his Italian journey, spoke with reverence of the "wonderful island city", which he "was privileged to visit" and in which he wished to reside "until I have satiated my desire to gaze on the image of this city". After endless warring with Genoa, Venice finally conquered her rival in 1380. From that date, the city was the unchallenged leader in world trade. In 1423 the Venetian Republic commanded a war fleet of 45 galleys specially built for combat and a merchant fleet of 300 galleys. With a population of over 200,000, Venice was one of the biggest, and certainly the richest, Western cities. Prosperity, optimism and cheerfulness reigned: "People sing in the squares, in the streets and on the canals. Merchants sing when they are prizing their wares; labourers sing when they leave their places of work; gondolieri sing when they are waiting for customers", remarked the Italian dramatist Carlo Goldoni in the eighteenth century. One wonders whether the Doge, the ruler of the Republic, sang when conducting the affairs of state. At any rate, he had to utter the same invocation each year on Ascension Day, which was the most important event in the city calendar: "O sea, we wed thee in the sign of our true and everlasting dominion". With this incantation, a vow renewed each year, the Venetians hoped to propitiate the primal forces of the sea to ensure their benevolence and willingness to do their share in securing the supremacy of the Republic in the Adriatic. In the days of the veduta painter Canaletto, the "nuptials widi the sea" were staged as an opulent and colourful cavalcade. The Doge boarded his ceremonial ship, the bucintoro, and sailed to the Porto di Lido, the principal gateway to Venice, where the "nuptials with the sea" took place. There he poured holy water into the sea and cast a gold ring overboard. The ritual has been revived in recent years. Now, of course, something very different is at stake. No longer are the power, influence and wealth of Venice to be enhanced. The decaying city once called the Serenissima ("Most Serene Republic") must be prevented from subsiding into the sea should a raging storm unleash the forces of nature.